I like to travel – and my favourite way to travel is haphazardly. Inspired by a postcard of Eilean Donan castle in the dying evening twilight that I found on my friend’s kitchen table, I unceremoniously threw my and Joel’s planned itinerary out the window. 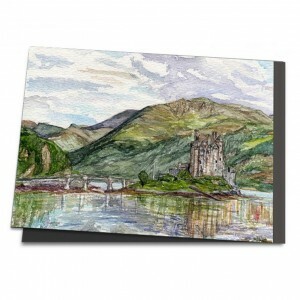 I decided to visit the castle in the Scottish highlands and paint it. It was a long way there, and hitchhiking would take ages and be totally arduous, but once my curiosity has been sparked like this, it’s hard for me to shake it off. Yes, and then we actually arrived, actually stood in the spot where the photo was taken. I felt so happy! Sitting by the edge of the lake, I started on my picture straightaway, while Joel immersed himself in playing imaginative games with pebbles and sticks. Hours went by without us speaking to one another, each in our own world. We had a sense of space and time, losing our sense of hunger and thirst. As soon as my picture was finished, a car stopped behind us on the path. A couple got out, and so I could ask them what time it was. ‘What? Half seven already?’ The shock went through me, as it was definitely too late to visit the castle. Should we stay another night in the vicinity? I’d already booked accommodation somewhere else! And when the couple offered us a lift there, I gladly accepted their offer. Now there’s one place in the world that I will definitely see again. It’s Eilean Donan castle, of which I want to see the inside too.